Horror movies are now a dime a dozen. They are easy to produce and typically perform well for a week or two before settling in for decent returns in the home video market. Very few horror movies are good. Most are just below mediocre, primarily because they refuse to do anything original and focus on gore instead of horror. Very few like An American Haunting are bad. It is just as mediocre as most other offerings, but goes the additional step of annoying the viewer. There is a twist/reveal at the end of the movie which presumably was supposed to make people gasp and explain everything. This is not the case; the twist actually has the opposite effect. The rest of the film doesn't make any sense. An American Haunting is based on events that took place in the early 1800s in Red River, Tennessee. Supposedly, this is the only documented case where a spirit caused a death. Ooh, spooky! Director Courtney Solomon (Dungeons & Dragons) based his screenplay on the novel by Brent Monahan, which is supposedly one of the explanations behind the phenomenon. There is a totally unnecessary foray into the modern world that frames what happens back in the 1800s. All Solomon accomplishes with this is to provide a narrator and to take out any momentum he was building in the 1800s by awkwardly jumping back to the present. The strange happenings start after a property deal gone bad. 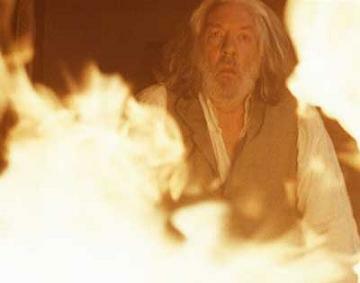 John Bell (Donald Sutherland, Ask the Dust, Lord of War) charged an exorbitant amount of interest to his neighbor, a reported witch. She curses him and his daughter, and shortly after, the Bells begin hearing noises. It sounds like somebody is in the house. Horrifically, their daughter Betsy (Rachel Hurd-Wood, Peter Pan) is the subject of attacks at night. Something pulls her blankets off, pins her to the bed, drags her around the floor by her hair, or suspends her in the air and pummels her. As time progresses, the attacks worsen. First, nobody believes Bell and his wife Lucy (Sissy Spacek, North Country, The Ring Two), but wary witnesses change their mind as they see firsthand what the Bells see. Nobody also believes why two acting powerhouses like Sutherland and Spacek would agree to be in a movie like this. Solomon favors a point of view perspective for his camerawork. The camera travels around the room, spinning often, to give the impression that the viewer sees what the spirit sees. He edits quickly, giving the film a choppy feeling. This is a lazy way to try to make things scarier, since the view constantly shifts. This is also a distraction from the ending and other deficiencies in the story. The Bells realize that the attacks are worst when Betsy is sleeping in her room. So of course they continue to let her sleep in her room. Uh, hello? They seem to do precious little except cower in horror. Two friends come in to try to help, but with little avail. No avail for the viewer either. 1 hour, 30 minutes, Rated PG-13 for intense terror sequences and thematic material.